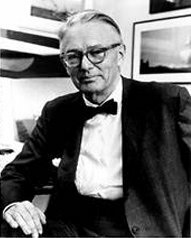 Olin Stephens II (1908-2008), was one of the most influential and prolific designers of the 20th century. After a short apprenticeship working on six meters, he joined forces with Drake Sparkman in 1930 to form the legendary S&S firm. The success of 'Dorade', commissioned by his father in the same year, helped put the company on the map.Many other designs were to follow including Baruna, Vim, Brilliant, Stormy Weather, Northern Light, and Nyala. In 1937, in collaboration with Starling Burgess, Stephens designed 'Ranger', the last and fastest of the J Class boats, which was selected to defend the Cup after only seven races. During the war, Sparkman & Stephens was heavily involved with the design of craft for the military. When racing for the Americas cup resumed 26 years later, his pre-war 12 meter 'Vim' was barely eliminated in the defender trials of 1958. The S&S designed 'Freedom' (1980) was the last 12-Meter to successfully defend the Cup. Olin Stephens was one of the primary figures in the development of rating rules from the CCA, to IOR, to IMS. (Boats listed here are some of series built sailing yachts from the firm Sparkman & Stephens).